Here in central PA our fishing season never really stops. Rather, it just transitions from one phase to another. Still, with spring only a few weeks away, I can't help but feel like we are at the doorstep of something new. After a long winter, it is undeniable that the upcoming warmer months bring with them some inherent excitement... and for me that excitement is deeply rooted in the plethora of possibilities for angling. There are so many different places to fish, so many different fish to target, and so many different techniques to employ--I'm getting excited just thinking about it! In my last blog entry I promised that I would give you a sneak peak into my tackle box for this upcoming season. Every year I try to experiment with some new lures--some new lure types, as well as some new versions of familiar lures. This year will be no different. I'm not going to show you everything that's in my tackle box this season, but here is a glimpse at a few of the lures I am looking forward to trying out. Since unwrapping these plugs and inspecting the beautiful paint jobs and high quality finish, I've been dreaming of feeding them to some hungry fish. 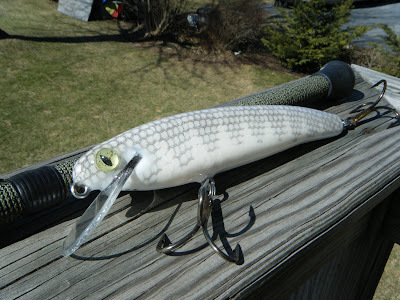 If you have not yet heard of Tuscarora Tackle, it is a local business that is owned and operated by Jeremy Wagner of East Waterford, PA. Jeremy specializes in building unique, custom fishing rods and hand-carved wooden lures. If you are interested in chec king out some more of Jeremy's work, click on this link to go to the Tuscarora Tackle website. 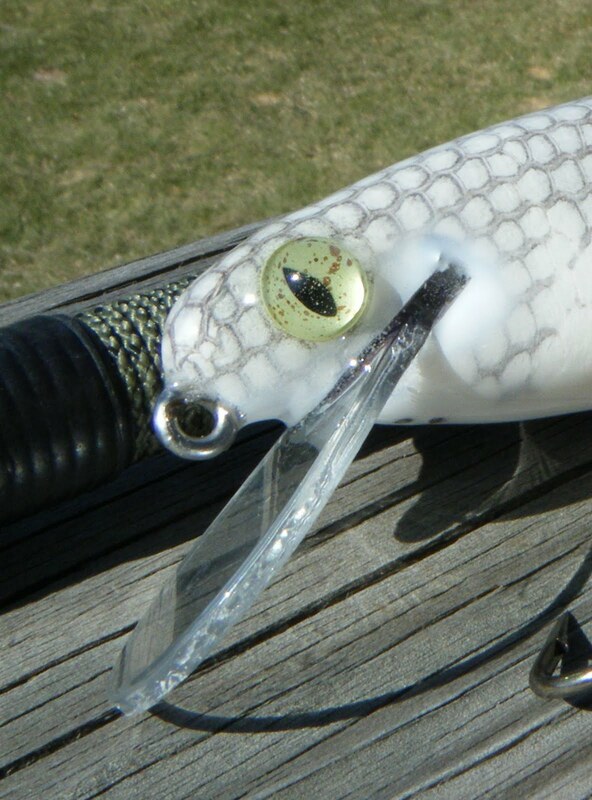 Jeremy builds shallow and deep diving plugs as well as some larger-lipped lures designed for trolling, but the plugs I own I would classify as primarily shallow-diving swimmers or twitch baits. I have only been able to swim these plugs a few times so far--just enough to inspect their action really. Still, what I have observed thus far has been very promising. From what I have seen in my short testing sessions, these lures perform just as they are designed... 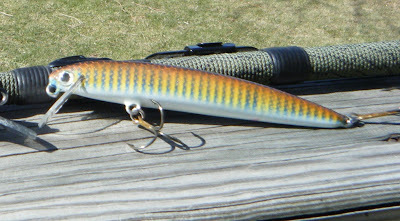 They will swim nicely as a wake bait--just under the surface--and can be pulled or twitched down to about a foot in depth. They have a nice wiggle and a very hard roll. In fact, the roll on these plugs is so hard that they almost turn 180 degrees from side to side... You have to see it to believe it really, and they look great. The plugs I own are floating models, but they are not extremely buoyant--when stopped under water they rise slowly to the surface. As far as aesthetics go, the paint jobs on these plugs are beautiful... And the hard epoxy finish is excellent--giving the impression they will be quite durable as well. 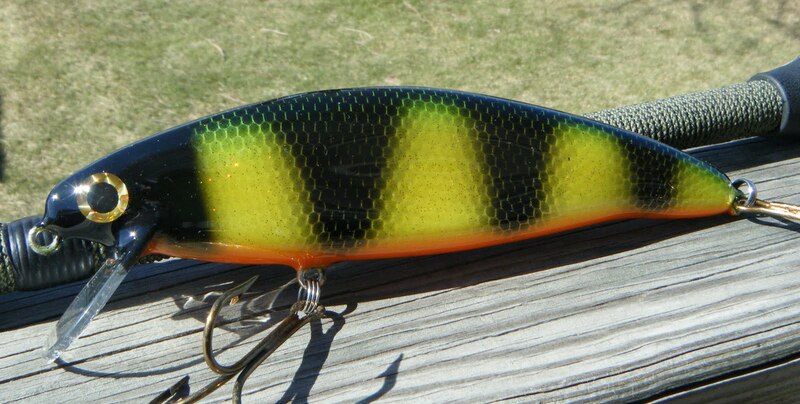 One paint pattern that I am particularly fond of is Jeremy's perch pattern. While it looks great to the eye when out of water, it is truly impressive when seen swimming underwater--the dark bands really stand out, and the colors seem to blend perfectly to match that of a live perch. 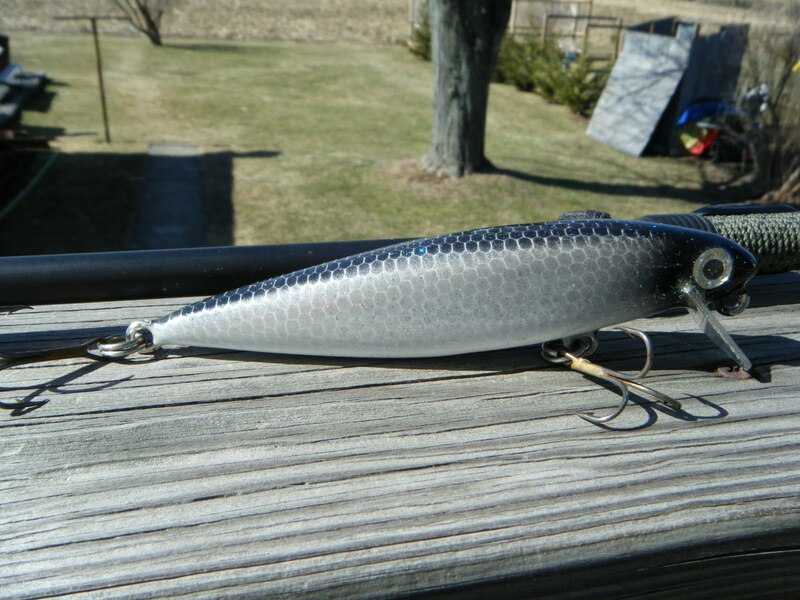 One thing I can tell you for sure, is that I know a few largemouth bass and tiger muskies in a particular lake that will be given the chance to pounce on my perch-colored, Tuscarora Tackle twitch bait this upcoming season. Well, that concludes Part I of your sneak peak into my tackle box this season... Hopefully I will see you back here soon for Part II. Until then, I hope you are able to get out and enjoy some time on the water this month. Thanks again for reading, and best of luck on the water. I appreciate you taking the time to do such a great article for me. I always enjoy reading your posts, you are a great story teller. Keep up the good work. Thank you Jeremy... Seriously. You keep cranking out those beautiful plugs also. I'm looking forward to hangin' some nice fish on them this coming year! I love to fishing and kayaking. I regularly follow lots of this type of blog. I am a huge fan of this blog. I got an another blog which do kayak review. . That is also wow!! !